Music has long been an important part of the Christian church and that tradition of sacred music is alive and well at St. John’s Lutheran Church. The church is home an excellent music ministry and has many fine instruments for accompaniment, especially its Casavant pipe organ. The original Casavant organ began as 50 ranks and was built by Casavant Freres Ltd., of Quebec. It was installed in 1954. In 1980, after more than 25 years of service, the organ underwent its first renovation to revoice and regulate its pipes. In 2000, the congregation undertook a larger project — not only to renovate and restore the organ, but also to enhance its sound. An Organ Committee was formed to study the organ’s needs, determine a budget and raise the funds. Church members responded to the appeal, raising more than $500,000 for the organ project. Ralph Hair chaired the Organ Committee. Committee members were Gordon Beaver, Marcus Smith, Karl Kinard, Bill Alsobrooks, Geneva Allen, Kathryn Terry, Dennis Rogers and Horace Rhyne. Oscho Rufty, St. John’s Facilities Coordinator, worked closely with the committee and with the Casavant Organ Company. The project was completed in two phases. 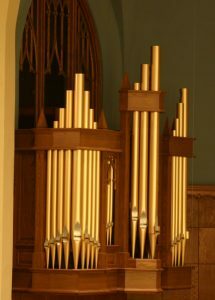 In the first phase, the firm of Robert Hiller, (Toronto, Canada), subcontractors for the Casavant Organ Company, removed the organ console and pipes. Workers cleaned, revoiced and reconfigured the pipes and releathered chests. The organ console was sent back to the Casavant Organ Company in Canada to be rebuilt and made digital and solid state. In the second phase, a group from Wagoner Construction reworked, insulated, painted and acoustically sealed each pipe chamber. Brackets and steel beams and girders were mounted and secured on each side of the church’s chancel and balcony to attach new cantilevered chests and a Festival Trumpet. The organ has four complete divisions — Great, Swell, Choir and Pedal. An antiphonal Festival Trumpet was added as a “fifth” floating division. The Festival Trumpet is located in the balcony and is situated on each side of the Good Shepherd stained-glass window. The Great division is split on each side of the chancel with the Choir division to the right of the chancel and the Swell division to the left of the chancel. The restored pipes were returned and new pipes added to increase the organ’s size from 50 ranks with 3,600 pipes to 72 ranks holding approximately 6,000 pipes. St. John’s Casavant Pipe Organ is probably the most powerful organ between Charlotte and Greensboro. The organ was dedicated in a magnificent recital on Sunday, November 14, 2004,by Robert Burns King, who is on the music faculty of UNC-Greensboro, and now retired as Organist-Choirmaster of First Presbyterian Church in Burlington. Rob Durocher serves as Minister of Music.